He was a hockey icon who battled management as much as any opponent on the ice. Although by the 1980s, Darryl Sittler was no longer a Toronto Maple Leaf, he will be remembered as one of the greatest Leafs to never win a Stanley Cup. His best years may have been in the 1970s as a Leaf, but in the 1980s he still made his mark. Through it all, Sittler stuck up for his teammates off the ice as much as on it. When I started watching hockey in the late 1970s, the only games we ever saw were Montreal Canadien or Toronto Maple Leaf games Saturday nights on Hockey Night In Canada. Leading the Toronto Maple Leafs, with a shock of curly brown hair was their captain and unquestioned leader, Darryl Sittler. He was a playmaker and a scorer who made an impact whenever he was on the ice. Although it was before I started watching hockey, he set the single-game scoring record with 10 points against my beloved Boston Bruins. That six-goal, four-assist performance, is still an NHL single-game record. He also suited up for Team Canada, scoring the winning goal in overtime to lead his team to the first ever Canada Cup in 1976. I have that goal, and the entire series, on DVD. His best years were in the 1970s, and by the time the 1980s rolled around I remember Sittler just as much for the battles he had with Leaf general manager Punch Imlach and team owner Harold Ballard. When I started watching hockey, the Leafs regularly made the playoffs. Two years in a row they were eliminated by the Canadiens, in the semi-finals in 1978, and in the quarter-finals the next year in 1979. The team had a cavalcade of stars – Sittler; Lanny McDonald; Ian Turnbull; Mike Palmateer; Dave “Tiger” Williams and more. Ballard slowly whittled away that core of great players by trading them. Palmateer was sent to Washington, Williams to Vancouver, and Turnbull to Los Angeles. Once Imlach joined the Leafs as general manager, he believed Sittler had too much power with the players. Trading Sittler would have been too costly and complicated. Instead, they shipped McDonald to Colorado right at the end of the decade, on Dec. 29, 1979. He was Sittler’s best friend, and it was definitely a power play on management’s part to exert his authority. I will never forget Sittler’s response. On Hockey Night In Canada on national television, the camera panned across the Leafs standing on the blue line for the national anthem. 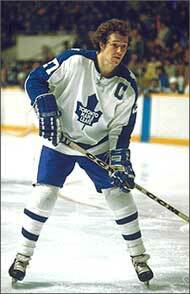 As the camera passed by Sittler, there was nothing but threads where his captain’s “C” once stood. The announcers did not say too much about it. What happened was Sittler had ripped the “C” from his chest in protest over McDonald’s trade. It would be another two years or so, when Sittler himself was dispatched out of town. At the start of the decade, Darryl Sittler was still a Leaf, and would wear the “C” again, but soon matters deteriorated again with management. Finally, on Jan. 20, 1982, Darryl Sittler, who had become synonymous with the Toronto Maple Leafs, was traded to the Philadelphia Flyers. It just seemed so foreign, like watching Ray Bourque in a Colorado Avalanche sweater, or Wayne Gretzky in a St. Louis Blues jersey. He had also donned a helmet, covering that shock of curly hair that made him stand out on the ice almost as much as his play did. Sittler had recorded 18 goals and 20 assists for 38 points in 38 games with the Leafs. 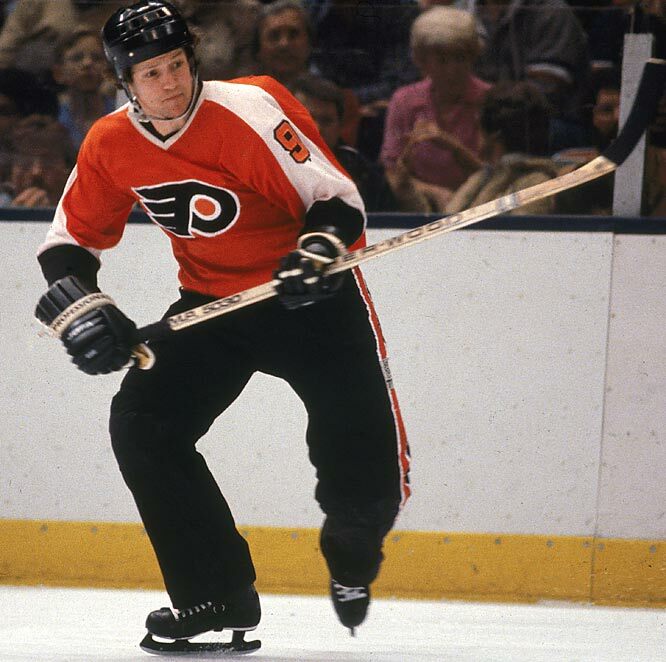 He would play 35 games with the Flyers to close out the 1981-1982 season, notching 14 goals and 18 assists, giving him season totals of 32 goals and 38 assists for 70 points. His first full season with the Flyers was 1982-1983, where he played 80 games, scoring 43 goals and adding 40 assists for 83 points, and his fourth all-star selection. The following year, 1983-1984 he played 76 games, scoring 27 goals and 36 assists for 63 points. 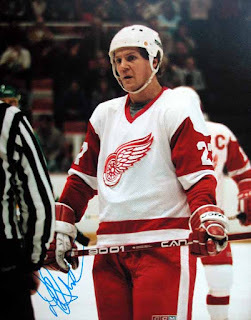 Before the 1984-1985 season, Sittler was traded to the Detroit Red Wings, where he had his worst year since his rookie season, scoring just 11 goals and 16 assists for 27 points in 61 games. Detroit bought out the rest of his contract and Darryl Sittler retired. Time seems to heal all wounds – or at least many of them. The last time I saw Darryl Sittler was recently at the Heritage Classic alumni game between retired members of the Leafs and Red Wings. There he was alongside McDonald and Palmateer, proudly wearing the Maple Leaf. With the deaths of his nemesis, Punch Imlach and Harold Ballard, Sittler has been a proud leader of Leafs Nation once again. Even current Leafs, who would do interviews with him on television, would themselves ask for his autograph once the cameras were off. It is fitting that he has mended fences with the Leafs, because Darryl Sittler was the face, and the beating heart, of the franchise at the dawn of the 1980s. He was a leader, role model, goal scorer, and play maker, who deserved much better from the franchise than the treatment he received at the end of his tenure in Toronto. Instead of riding off into the sunset, as is befitting of a franchise player, Sittler was shuffled out of town in mid-season with no chance to say goodbye. Worse, he was never brought back to say a proper goodbye to the fans who supported him. However, now Darryl Sittler is getting the last laugh on his old adversaries, proudly wearing the Maple Leaf on his chest once again, and representing what the franchise had been. In the end, the Leafs did the right thing – but it took new owners and management. It is good to see you back where you belong Darryl. The Canadian Walk of Fame recently unveiled the stars of a number of outstanding individuals on June 7 and Robvogt80s will be honouring those people in a series.